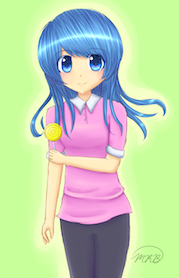 This computer generated anime art piece called “Yellow Lollipop Girl” is presented with large blue eyes as well as flowing blue hair and wearing a pink shirt with white collar and cuffs. Yellow Lollipop Girl wears black slacks and holds a delicious yellow swirled lollipop in her left hand. Her blue hair shines in anime art style. Yellow Lollipop Girl stands before a bright neon green background. She was one of Mareena’s first computerized anime art style drawings; and is available in card as well as poster print.